74 records – page 1 of 2. Photograph of the interior of the Love farmhouse kitchen while Elsie (nee Love) Hughes, her husband John and son Brent lived in the house. The house was located at 7651 Cumberland Street (Address pre 1960: 1390 Cumberland Road) and was moved from its original site to the Burnaby Village Museum in 1988 and designated a Municipal Heritage Landmark in 1992. Photograph of a wall in the Love farmhouse kitchen while Elsie (nee Love) Hughes, her husband John and son Brent lived in the house. The tongue and groove walls are painted white with teal blue borders and burgundy trim. A small clock sits on top of shelf on the wall. There is a narrow printed fabric banner hanging to the left and a relief of two birds sitting on a branch to the right. The original tongue and groove walls were built by George Love (Elsie's uncle). The house was located at 7651 Cumberland Street (Address pre 1960: 1390 Cumberland Road) and was moved from its original site to the Burnaby Village Museum in 1988 and designated a Municipal Heritage Landmark in 1992. Photograph of the interior of the Love farmhouse living room while Elsie (nee Love) Hughes, her husband John and son Brent lived in the house. This room was closed off and used as a bedroom by Jesse and Martha Love while they lived there. The house was located at 7651 Cumberland Street (Address pre 1960: 1390 Cumberland Road) and was moved from its original site to the Burnaby Village Museum in 1988 and designated a Municipal Heritage Landmark in 1992. Photograph of the interior of the Love farmhouse kitchen while Elsie (nee Love) Hughes, her husband John and son Brent lived in the house. A black wood stove sits between two windows and a drying rack for laundry is hanging above.The house was located at 7651 Cumberland Street (Address pre 1960: 1390 Cumberland Road) and was moved from its original site to the Burnaby Village Museum in 1988 and designated a Municipal Heritage Landmark in 1992. Photograph of the interior of the Love farmhouse dining room while Elsie (nee Love) Hughes, her husband John and son Brent lived in the house. The dining room table and chairs sits at the centre with a large hanging glass light fixture above and a picture window looking out into the side yard. The house was located at 7651 Cumberland Street (Address pre 1960: 1390 Cumberland Road) and was moved from its original site to the Burnaby Village Museum in 1988 and designated a Municipal Heritage Landmark in 1992. Photograph of the interior of the Love farmhouse dining room while Elsie (nee Love) Hughes, her husband John and son Brent lived in the house. Stairs and door lead to the upper floor, the door to left leads to the kitchen and and doors to the right lead to a closet and the front hall. The house was located at 7651 Cumberland Street (Address pre 1960: 1390 Cumberland Road) and was moved from its original site to the Burnaby Village Museum in 1988 and designated a Municipal Heritage Landmark in 1992. Photograph of the northern exterior of the Love farmhouse while Elsie (nee Love) Hughes, her husband John and son Brent lived in the house. The one storey section housed the kitchen which was added in 1903 to the original house which was built in 1893. The house is located at 7651 Cumberland Street (Address pre 1960: 1390 Cumberland Road) and was moved from its original site to the Burnaby Village Museum in 1988 and designated a Municipal Heritage Landmark in 1992. Photograph of the exterior of the west side of the Love farnhouse while Elsie (nee Love) Hughes, her husband John and son Brent lived in the house.The one storey section housed the kitchen which was attached to the main house in 1903. The house was located at 7651 Cumberland Street (Address pre 1960: 1390 Cumberland Road) and was moved from its original site to the Burnaby Village Museum in 1988 and designated a Municipal Heritage Landmark in 1992. Photograph of the exterior of the Love farmhouse taken from the corner of Fourteenth Avenue and Cumberland Street while Elsie (nee Love) Hughes, her husband John and son Brent lived in the house. The house was located at 7651 Cumberland Street (Address pre 1960: 1390 Cumberland Road) and was moved from its original site to the Burnaby Village Museum in 1988 and designated a Municipal Heritage Landmark in 1992. Photograph of two women standing by the wooden picket fence that surrounds the Jesse Love Farmhouse (very high pickets have been used for part of the fence).The Love farmhouse was located at 1390 Cumberland Road (after 1960- address was changed to 7651 Cumberland Street). 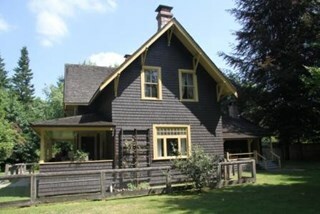 The Love farmhouse was relocated to the site of the Burnaby Village Museum in 1988 where it was restored to the 1920s era. Note in pencil on verso of photograph reads: "Jesse Love Farmhouse Burnaby BC"
Photograph of the Jesse Love farmhouse. The Love farmhouse was located at 1390 Cumberland Road (after 1960- address was changed to 7651 Cumberland Street). The Love farmhouse was relocated to the site of the Burnaby Village Museum in 1988 where it was restored to the 1920s era. Note in pencil on verso of photograph reads: "Jesse Love Farmhouse"
Photograph of the interior of the Love farmhouse kitchen. while Elsie (nee Love) Hughes, her husband John and son Brent lived in the house. A large dining table sits in the forefront of the photograph and a wood stove sits against the back wall with a wooden drying rack suspended over top and an electric stove to the right. The house was located at 7651 Cumberland Street (Address pre 1960: 1390 Cumberland Road) and was moved from its original site to the Burnaby Village Museum in 1988 and designated a Municipal Heritage Landmark in 1992. Elsie is the daughter of Sarah (nee Love) and William Parker. Sarah and William purchased the house in 1928, shortly after the death of Sarah's father, Jesse Love. Sarah and William Parker lived in the house with their three children, Albert, Bill and Elsie. William Parker died in 1961 and Sarah continued to live in the house until 1966 before selling it to her daughter Elsie and son in law John Hughes. Elsie and John lived in the house with their son Brent until 1971. Photograph of the interior of the Love farmhouse dining room with a large picture window and open doorway into a living room with a television set in the corner. The living room off of the dining room was once closed in and used as a bedroom for Jesse and Martha Love and was restored after the house was moved from it's location of 7651 Cumberland Street (Address pre 1960: 1390 Cumberland Road) to the Burnaby Village Museum in 1988. This photograph was taken while Elsie Hughes (nee Love), her husband John Hughes and son Brent Hughes lived in the house. Elsie is the daughter of Sarah (nee Love) and William Parker. Sarah and William purchased the house in 1928, shortly after the death of Sarah's father, Jesse Love. Sarah and William Parker lived in the house with their three children, Albert, Bill and Elsie. William Parker died in 1961 and Sarah continued to live in the house until 1966 before selling it to her daughter Elsie and son in law John Hughes. Elsie and John lived in the house with their son Brent until 1971. The Jesse Love House is a vernacular example of a late Victorian-era wood-frame farmhouse with later Arts and Crafts alterations and additions, that has been relocated to the Burnaby Village Museum. This two-storey house has an L-shaped plan, with a compound gabled roof, overhanging eaves and a large wraparound verandah. The value of the Jesse Love House lies in its comprehensive representation of an early Burnaby farmhouse, and the typical additive growth of a home as the resident family prospered. 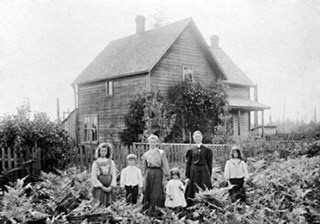 Jesse Love (1849-1928) and his wife Martha Love (1858-1920) moved to Burnaby in 1893 with their family to start a fruit ranch and market garden on Cumberland Road in the East Burnaby district. Jesse Love was actively involved in community affairs, serving on the Burnaby School Board and also as a District Councillor in 1901 and from 1904-07. The original house was constructed by local builder George Salt and consisted of an entrance hall, dining room, lean-to kitchen, master bedroom and several rooms upstairs. As the family grew and prospered, additions were made to the house including a parlour, more bedrooms upstairs, and a large permanent kitchen. Jesse Love was actively involved in community affairs, and the kitchen became a local gathering spot for political discussion and civic organizations. The verandah, exterior shingle cladding, large windows, running water and electricity were eventually added as well. The heritage value for this house also lies in its interpretive value within the Burnaby Village Museum. The site is an important cultural feature for the interpretation of Burnaby’s heritage to the public. The house was moved to the Burnaby Village Museum in 1988 and both the interior and exterior were restored and interpreted to their 1925 period, including reproduction wallpaper. Burnaby Village Museum is comprised of a single municipally-owned property located at 6501 Deer Lake Avenue, Burnaby. Photograph of the upper hallway of the Love farmhouse while Elsie (nee Love) Hughes, her husband John and son Brent lived in the house. The house was located at 7651 Cumberland Street (Address pre 1960: 1390 Cumberland Road) and was moved from its original site to the Burnaby Village Museum in 1988 and designated a Municipal Heritage Landmark in 1992. Photograph of the exterior of the Love farmhouse located at 7651 Cumberland Street (Address pre 1960: 1390 Cumberland Road) with trees and bushes in the front yard and the driveway to the right. This photograph was taken while Elsie Hughes (nee Love), her husband John Hughes and son Brent Hughes lived in the house. Elsie is the daughter of Sarah (nee Love) and William Parker. Sarah and William purchased the house in 1928, shortly after the death of Sarah's father, Jesse Love. Sarah and William Parker lived in the house with their three children, Albert, Bill and Elsie. William Parker died in 1961 and Sarah continued to live in the house until 1966 before selling it to her daughter Elsie and son in law John Hughes. Elsie and John lived in the house with their son Brent until 1971. Photograph of a side view of the exterior of the Love farmhouse located at 7651 Cumberland Street (Address pre 1960: 1390 Cumberland Road) with trees and bushes along the side of the house and a gravel driveway. In this side view of the house, you can see the kitchen addition and verandah. This photograph was taken while Elsie Hughes (nee Love), her husband John Hughes and son Brent Hughes lived in the house. Elsie is the daughter of Sarah (nee Love) and William Parker. Sarah and William purchased the house in 1928, shortly after the death of Sarah's father, Jesse Love. Sarah and William Parker lived in the house with their three children, Albert, Bill and Elsie. William Parker died in 1961 and Sarah continued to live in the house until 1966 before selling it to her daughter Elsie and son in law John Hughes. Elsie and John lived in the house with their son Brent until 1971. Photograph of the south east side of the Love farmhouse located at 7651 Cumberland Street (Address pre 1960: 1390 Cumberland Road). Flowers grow on trellises against the verandah and a dog sits on the lawn alongside gardens, trees, wooden chairs and a picnic table. This photograph was taken while Elsie Hughes (nee Love), her husband John Hughes and son Brent Hughes lived in the house. Elsie is the daughter of Sarah (nee Love) and William Parker. Sarah and William purchased the house in 1928, shortly after the death of Sarah's father, Jesse Love. Sarah and William Parker lived in the house with their three children, Albert, Bill and Elsie. William Parker died in 1961 and Sarah continued to live in the house until 1966 before selling it to her daughter Elsie and son in law John Hughes. Elsie and John lived in the house with their son Brent until 1971. Photograph of the exterior of the Love farmhouse taken at the corner of Fourteenth Avenue and Cumberland Street. The house is hidden behind large trees at it's orignal address of 7651 Cumberland Street (Address pre 1960: 1390 Cumberland Road). This photograph was taken while Elsie Hughes (nee Love), her husband John Hughes and son Brent Hughes lived in the house. Elsie is the daughter of Sarah (nee Love) and William Parker. Sarah and William purchased the house in 1928, shortly after the death of Sarah's father, Jesse Love. Sarah and William Parker lived in the house with their three children, Albert, Bill and Elsie. William Parker died in 1961 and Sarah continued to live in the house until 1966 before selling it to her daughter Elsie and son in law John Hughes. Elsie and John lived in the house with their son Brent until 1971. Photograph of the exterior of the Love farmhouse taken at the corner of Fourteenth Avenue and Cumberland Street. The north side of the house and kitchen are in view with large trees covering the front of the house at it's orignal address of 7651 Cumberland Street (Address pre 1960: 1390 Cumberland Road). This photograph was taken while Elsie Hughes (nee Love), her husband John Hughes and son Brent Hughes lived in the house. Elsie is the daughter of Sarah (nee Love) and William Parker. Sarah and William purchased the house in 1928, shortly after the death of Sarah's father, Jesse Love. Sarah and William Parker lived in the house with their three children, Albert, Bill and Elsie. William Parker died in 1961 and Sarah continued to live in the house until 1966 before selling it to her daughter Elsie and son in law John Hughes. Elsie and John lived in the house with their son Brent until 1971. Photograph of the south east side of the Love farmhouse located at 7651 Cumberland Street (Address pre 1960: 1390 Cumberland Road). Flowers are growing on trellises against the pillars of the verandah and there are two wooden lawn chairs and a picnic table on the lawn under a large tree. This photograph was taken while Elsie Hughes (nee Love), her husband John Hughes and son Brent Hughes lived in the house. Elsie is the daughter of Sarah (nee Love) and William Parker. Sarah and William purchased the house in 1928, shortly after the death of Sarah's father, Jesse Love. Sarah and William Parker lived in the house with their three children, Albert, Bill and Elsie. William Parker died in 1961 and Sarah continued to live in the house until 1966 before selling it to her daughter Elsie and son in law John Hughes. Elsie and John lived in the house with their son Brent until 1971. Photograph of the front hallway and entrance door of the Love farmhouse while Elsie (nee Love) Hughes, her husband John and son Brent lived in the house. The house was located at 7651 Cumberland Street (Address pre 1960: 1390 Cumberland Road) and was moved from its original site to the Burnaby Village Museum in 1988 and designated a Municipal Heritage Landmark in 1992. Photograph of the interior of the Love farmhouse parlour / music room while Elsie (nee Love) Hughes, her husband John and son Brent lived in the house. There is a piano and stereo against the outside interior walls and a large picture window. The house was located at 7651 Cumberland Street (Address pre 1960: 1390 Cumberland Road) and was moved from its original site to the Burnaby Village Museum in 1988 and designated a Municipal Heritage Landmark in 1992. This artifact was used at the official opening of the Love Farmhouse exhibit, November 29, 1998; for distribution. The Jesse and Martha Love Farmhouse - Leaflet -- . Information leaflet for the opening of the Jesse and Martha Love farmhouse. 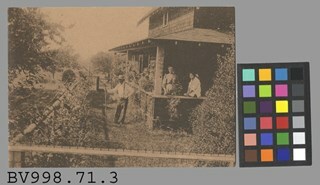 The front of the leaflet has a sepia toned photograph of Jesse Love standing in front of the garden, Martha Love and one of their daughters standing on the porch of the house. Inside, there is a picture of the reproduced wallpaper and information regarding the house. On the back of the leaflet is the City of Burnaby logo for Parks, Recreation and Cultural Services. The leaflet measures 18cm x 13.5cm. Photograph of couple, William Parker and Sarah Love Parker, in the garden at the Love farmhouse on Cumberland Avenue. The couple stand to the left and there is a tree in bloom to the right. There is a house in the background. Written on the verso in black ink: "Gramps William Parker / & Grams Sarah [ditto]." Stamped on the verso in black ink: "THIS IS A / KODACOLOR PRINT / MADE BY / EASTMAN KODAK COMPANY / T.M. REGIS. U.S. PAT. OFF. / Week of September 7, 1953 / IV"
All artifacts are from the Love farmhouse. The house was lived in by generations of the Love family. Jesse and Martha Love's daughter, Sarah Love married William Parker and their daughter, Elsie (later Hughes) was the mother of Brent Hughes. The objects were in the house when the donor lived in the house. Photograph of Jesse and Martha Love with two of their daughters in front of their farmhouse. Martha is wearing an apron and Jesse is holding his neck with his left hand. The Love farmhouse was located at 1390 Cumberland Road (after 1960- address was changed to 7651 Cumberland Street). The Love farmhouse was relocated to the site of the Burnaby Village Museum in 1988 where it was restored to the 1920s era. Note in pencil on verso of photograph reads: "Jesse and Martha Love and 2 daughters Jesse Love Farmhouse"
See extensive history of Love Family and Love farmhouse located at Burnaby Village Museum. File consists of a series of personal letters from family members in England to Jesse and Martha Love., including; Sept 22, 1880- to Jesse and Martha Love from Jesse's mother Elizabeth Love; June 7th, 1880- to Jesse from his mother Elizabeth Love; June 9th, 1880- Letter to Jesse Love from his mother Elizabeth Love; April 26, 1880 - to Jesse and Martha Love from Jesse's mother Elizabeth Love; May 21, 1881 -To Jesse Love from one of his sisters regarding his mother's death; Jan 18, 1892 - Swindon - to Jesse from his sister, informing him of his father's death; 8th Jan 1906 - to Jesse from his sister,Torie Love; 28 Oct 1910 - to Martha Love from Jesse's sister Torie Love; 27th, (month?) 1910 - to Jesse Love and one of his sisters from Jesse's sister Torie; 14th July 1911 - Letter to Jesse and Martha Love from Jesse's sister Torie; an envelope - addressed to "Mr. Jesse Love / East Burnaby, New Westminster / B.C." postmarked "Jan __ 05 / SWINDON STATION" (does not appear to relate to any of the dates of the letters) and a small evelope addressed to : "Mrs Love / Burnaby". 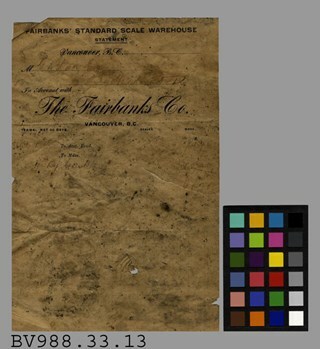 Fairbanks' Standard Scale Warehouse - Statement -- [190-?]. Bill statement from Fairbanks' Standard Scale Warehouse for G.R. Love Esq. of New Westminster B.C. There is faint writing on the page with the only really legible writing being "By Cash". The statement measures 13.5cm x 20.5cm. object was found in the Jesse Love farmhouse when moved to the Museum. Item consists of a memorial for Elizabeth Love and reads "IN LOVING MEMORY OF / Elizabeth, / WIFE OF RICHARD LOVE / (LATE RUBRO FARM, SOUTH MARSTON.) / Who fell Asleep in Jesus, 21st of May, 1881 / AGED 72 YEARS". A short, religious poem is printed on one fragment of the card. Photograph of the interior of the Love farmhouse parlour with a large picture window, piano, floral drapery and two ornate chairs. The house was located at 7651 Cumberland Street (Address pre 1960: 1390 Cumberland Road). This photograph was taken while Elsie Hughes (nee Love), her husband John Hughes and son Brent Hughes lived in the house. Elsie is the daughter of Sarah (nee Love) and William Parker. Sarah and William purchased the house in 1928, shortly after the death of Sarah's father, Jesse Love. Sarah and William Parker lived in the house with their three children, Albert, Bill and Elsie. William Parker died in 1961 and Sarah continued to live in the house until 1966 before selling it to her daughter Elsie and son in law John Hughes. Elsie and John lived in the house with their son Brent until 1971. Four older women pose for photograph in building lobby. From left to right are: Phoebe Love Feedham, Minnie Love Mackenzie, Esther (Eddie) Love Stanley, and Sarah Love Parker. There are palms and other large plants in the background. Written on the verso in black ink: "A. Phoebe, A. Minnie, A. Eddie, / Grams. / 4 Love sisters"
File consists of a hand written "Copy / Will of / Miss Ann Elisabeth Love / deceased x?" of Kent, England dated 1919. Fileconsists of a three memorial cards for Martha Love which read: "In Loving Memory / OF / Martha Love / BELOVED WIFE OF JESSE LOVE / CUMBERLAND ROAD, BURNABY, B.C. / Died August 24RD. 1920 / AGED 62 YEARS / INTERRED IN I.O.O.F. CEMETERY, SAPPERTON / NEW WESTMINSTER, B.C., AUGUST 26TH, 1920". A short, religious poem is printed on the inside face of the card. "IN LOVING / MEMORY" with an image of a rose is printed on the front face of the card. "From Certificate No. 35010 No 48502 / Certificate of Indefeasible Title / Date of Application for registration the 1st day of August, 1928 / Register, Vol. 559" printed and hand written at top of main page of document. File consists of a "Certificate of Indeasible Title" transferring title to property in South Vancouver (Lots 11 and 12 of Lots 9 to 13, Block 16, District Lot 352, Group One, New Westminster District / Plan 1344) to the children of Jesse Love. The application was registered August 1, 1928 and signed and witnessed and sealed on August 2, 1928. The reverse side of the ledger page document is titled "Charges, Liens and Interests"
File consists of a Declaration of Trust between Wallace Whiting and George R. Love. The document is signed by Wallace Whiting and John Kennedy on November 5, 1920. File consists of a hand written document supporting the Last Will and Testament of Ann Elisabeth Love, of Kent, England. The document is a listing of expenses and receipts for the estate and is titled "The Executors of Miss A.E. Love deceased / in account with / Mr. Jesse Love Residuary Legalee. Hand written document supporting the Last Will and Testament of Ann Elisabeth Love, of Kent, England. The document is two pages and contains a listing of expenses and receipts for the estate with the title "The Executors of Miss A.E. Love deceased / Sale Account / 1919". Last Will and Testament of Jesse Love. The document is type written on an unlined legal size sheet of paper. The will is signed and witnessed October 1920. File consists of three memorial cards for Thomas Richard Love which read: "IN LOVING MEMORY / OF / THOMAS ROBERT LOVE / WHO PASSED AWAY AT / CUMBERLAND ROAD, EAST BURNABY, B.C. / NOVEMBER 23RD. 1918 / AGED 31 YEARS / Rest in Peace".A short, religious poem is printed on the inside face of the card. "MADE IN ENGLAND" is printed very small in the lower right hand corner of the back of the card. Thomas Robert Love served in World War I and was a victim of the 1918 flu epidemic. File consists of a series of letters from solicitors in England concerning the settlement of the estate and properties of Ann Elisabeth Love (sister of Jesse Love) as well as disbursement of stocks invested in the English railways. The file also includes an add taken out bythe Executors in Swindon regarding five houses on Lots 1-5 that were owned by Ann Elisabeth Love. File consists of information pages pertaining to Jesse and Martha Love and their farmhouse (now a part of the Burnaby Village Museum). File consists of CERTIFICATE OF ENCUMBRANCE / #25320 Land Registry Office / New Westminster, B.C. / 30 minutes past 10 o'clock 10th day of March 1925" regarding the title to"Lot 56 of Lot 7, Suburban Block 1, Map 2620 in the City of New Westminster" with the "Registered Owner : Jesse Love" to mortgage said property to John Whiting. File consists of a Land Sale Agreement of Block "B" of District Lot 25, between Jesse Love and Duncan G. McLennan (Trustee). Signed, witnessed August 3, 1911 and sealed at Lougheed & Company, 2343 Main Street, Vancouver.